With people’s awareness of environmental protection, everyone advocates green travel to protect their world. So, a number of people prefer to choose electric bike as their transportation tool. Especially those who living in city or the work place near their house would like to choose electric bicycle which is a portable city folding electric bicycle around their life. 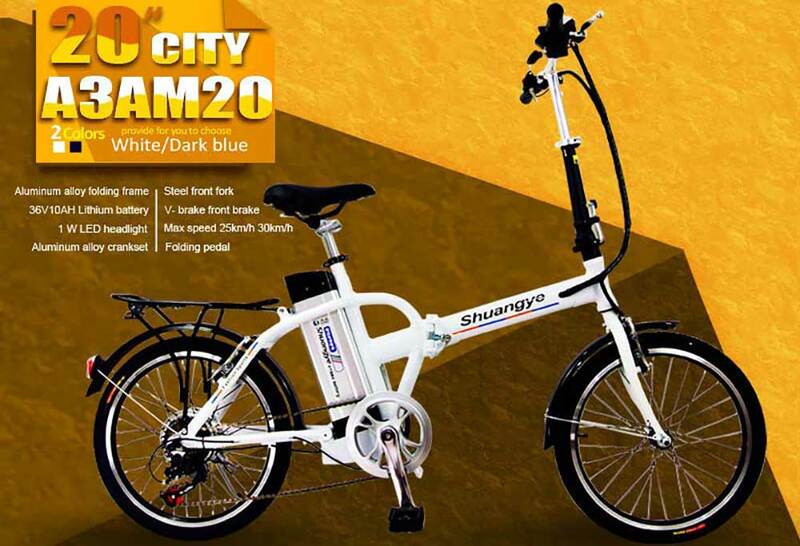 Shuangye A3AM20 city folding electric bicycle with 20-inch wheels, which the city folding electric bicycle portable to give people a convenience life when they want to grocery shopping or ride the electric bike in the city. City folding electric bicycle must the best transportation tool to choose. And the city folding electric bicycle is suit to university students in campus when students have class around the campus. It helps university students saving too much time on the way to classroom and have much time to do other things. Never worry be late. If you ride a city folding electric bicycle to have class or go to work. Do not worry no place to park it, you can fold it up and put it behind the classroom or beside you work place where never hinder others. The 36V 9Ah lithium-ion battery is installed behind the seat post with locked, and the charge time is 5-7 hours. The city folding electric bicycle has a powerful brushless motor of 36V 250W which gives a boost of up 25km/h. You do not worry if the battery run out of electric quantity we should we do, it can also turn into a non-electric bike when the battery run out of electric quantity. The city folding electric bicycle main frame made up 6061 Aluminum frames with rust resistant chain, comfortable saddle, shimano derailleur and 1:1 pedal assistant. For your safety, we use V brakes for front brake and rear brake. It make the city folding electric bicycle cheaper than other disc brakes city electric bicycle. The city folding electric bicycle have a 1W LED front light and reflectors which can help you to see the road ahead when you ride in a dark environment, get home later after work or cloudy weather. With these components, our city folding electric bicycle can give users a comfortable and excellent experience. And the city folding electric bicycle has an LCD pass display, you can know the electric quantity, temperature, velocity, motor power and so on. You can know that information at any time. based on these, you can adjust your plan what you like. We also install seat quick release on the city folding electric bicycle, you can adjust the seat post depend on you like and need. If you want to know more detail about 36V 250W city folding electric bicycle, please contact us freely.